SAM Frankland hit a sparkling century to help Woodlands overcome Lightcliffe by 67 runs in the Allrounder Bradford Premier League last Saturday. Frankland struck four sixes and eight fours in his 101 which helped his side to a total of 210, with support coming from opening partner Tim Jackson (33) as young spinner Daanyaal Ahmed took 3-56 for Lightcliffe. Inconsistent Lightcliffe were bowled out for 143 with opener Kasir Maroof top scoring with 35 and Ian Philliskirk (30) as Kez Ahmed picked up 3-21 with his off spin. Victory leaves Woodlands third in the table, 17 points behind leaders Hanging Heaton with four games remaining. Heaton made short work of their derby clash at Batley as they maintained 10-point lead at the top of the table. It was the first senior league Batley derby between the sides in almost 40 years but it is one the Mount Pleasant side will want to forget as the contest lasted less than 44 overs in total. Batley were bowled out for just 74 as left-arm spinner Muhammad Rameez produced a superb spell of 6-14 from 9.3 overs, with opener Sufyan Patel (30) the only batsman to offer resistance. Table-topping Heaton raced to their target in 16.3 overs with the in-form Callum Geldart making 45 not out. Second-placed Farsley bounced back from their heavy defeat by title rivals Hanging Heaton the previous week as they beat Bradford & Bingley by 92 runs at Red Lane. South African opener James Price was in good touch and top scored with 69 while captain Ryan Cooper made 47 against his old club in Farsley’s total of 218. Left-arm spinner Noman Ali was the pick of the Bradford & Bingley bowlers with 4-53. Yorkshire bowler James Wainman produced another fine performance with the new ball and was rewarded with a return of 5-32 as Bradford & Bingley were all out for 126. 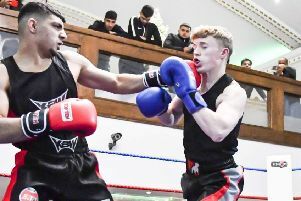 Spinner Adam Ahmed chipped in with 3-43 while Yassir Abbas (33) top scored for the Wagon Lane outfit as Farsley maintained their hopes of the title.